Kilmarnock manager Steve Clarke says that referee Steven McLean struggles to manage games involving his club because his father used to play for the Ayrshire side. McKenna’s goal half-way through the second period was a brief highlight in a controversial, scrappy encounter that at times was brutal to watch. 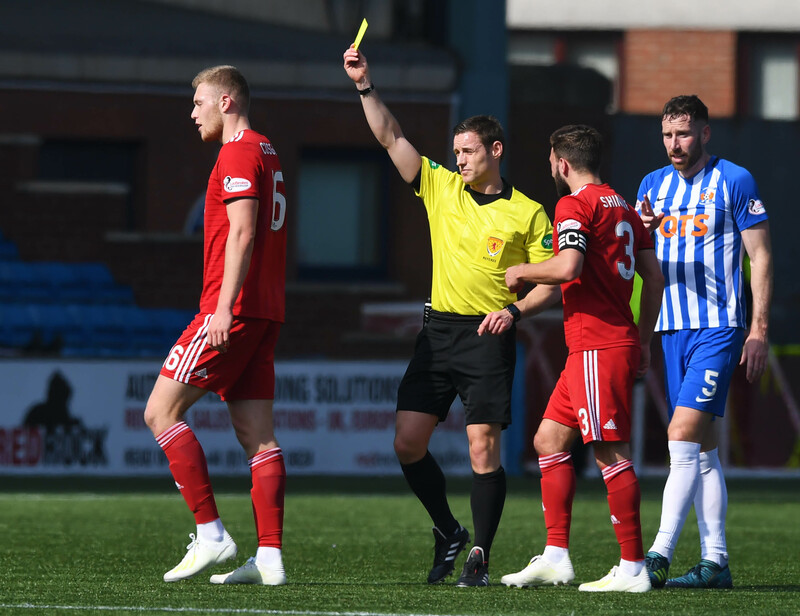 Kirk Broadfoot was sent off in the first half for a challenge on Dons goalkeeper Joe Lewis, while Stuart Findlay received his marching orders late on for two bookings. Rory McKenzie was then dismissed in stoppage time for a clash with Dom Ball, leaving Rugby Park incensed. Victory gives Aberdeen sole control of third spot, ahead of a visit to Ibrox next weekend. After the 3-0 humbling in the Scottish Cup semi-final against Celtic last week, manager Derek McInnes made three alterations to his side. Lewis Ferguson missed out through suspension, Dean Campbell dropped to the bench and Greg Stewart sat out with sciatica, with Graeme Shinnie, Mikey Devlin and Stephen Gleeson – making his first start since September – coming in. Little ground was going to be given between these two sides, both fighting for third spot in the table. Killie felt they should have had a man advantage inside the first 10 minutes, with Devlin dragging down Brophy when he was set to charge for goal. Referee Steven McLean only booked the Dons defender, however. Aberdeen’s Sam Cosgrove (L) is shown a yellow card by referee, Steven McLean. Aberdeen’s first clear opportunity came on 12 minutes when Stevie May delivered a free-kick to the back post for Scott McKenna, who headed across the face of goal. Shinnie was unable to turn it in. The game struggled for flair or ingenuity, with both sides seemingly more intent on going toe-to-toe with each other physically rather than technically. Brophy kept going up against Devlin, while Sam Cosgrove against Broadfoot was a battle where neither would cede superiority lightly. The home faithful were baying for blood when Cosgrove chopped down Stuart Findlay just after being booked, who he then tangled with at the resulting free-kick. Findlay pushed Cosgrove to the ground and earned a booking but the Aberdeen striker could count himself lucky. Tempers continued to simmer before boiling over with Broadfoot’s red card, for going in on goalkeeper Joe Lewis. McLean rushed to the scene to separate the players and Lewis received treatment before continuing. 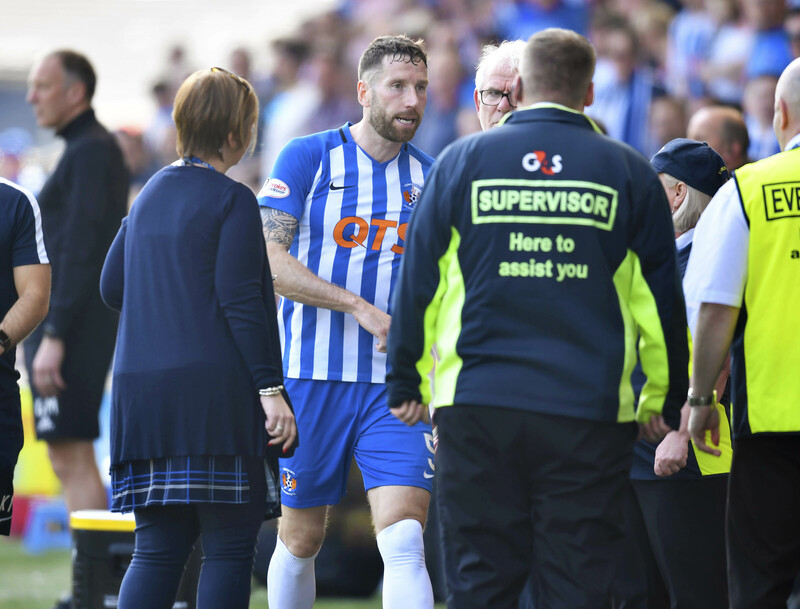 Kilmarnock’s Kirk Broadfoot trudges off the field after receiving a straight red card. 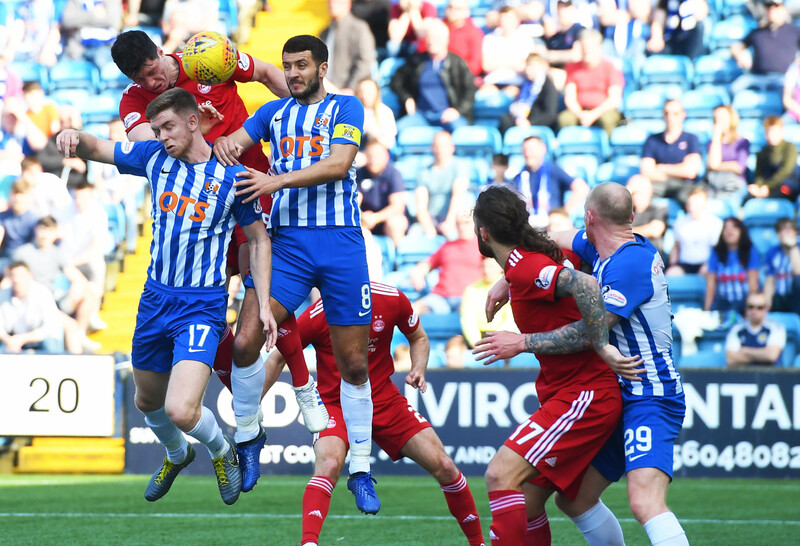 Cosgrove was duly replaced at half-time for James Wilson and the flashpoints continued, this time Scott McKenna earning a yellow for remonstrating with Greg Taylor, after Stevie May and Youssouf Mulumbu clattered into each other in the Killie box. Wilson headed Dominic Ball’s cross over from 12 yards but Aberdeen were yet to make their man advantage count as the second half reached it’s mid-way point. They found the decisive goal in the 67th minute as McKenna leaped highest to head in Shinnie’s corner, despite the best efforts of Mulumbu on the line. The Dons were fortunate to stay in front when Conor McAleny was picked out by Findlay, with the wide man escaping his marker far too easily. However Ethan Ross managed to backtrack in time and get enough on his block to divert the ball wide. Scott McKenna rises highest to head home the winner. Killie were reduced to nine men with five minutes to go as Findlay picked up his second booking, chopping down Shinnie and leaving him hobbling off the pitch. He returned to the field for the closing minutes, as McKenzie was then red-carded in stoppage-time, as he and Ball came together in the middle of the park, with the Killie winger being sent off and Ball escaping unpunished. Aberdeen leap-frogged Kilmarnock into the third place that brings European qualification with a 1-0 win at Rugby Park. Boss Derek McInnes is confident the injury-hit Dons are still strong enough to secure European qualification.